For each style of easel included in this post, we’ve included at least two brands that are recommended by thousands of artists from the WonderStreet community and consumer review sites. Each brand is accompanied by a list of pros and cons, but please remember that a pro for one artist may be a con for another. Though there are many hundreds of easels available on the market, we’ve done our best to compile those that are the most popular and rated well by artists. We are not connected to any brand mentioned in this article and base our conclusions on the feedback from the artists of our community and from online reviews from a variety of web-based merchants. We invite you to tell us more about your favourite easel in the comments section at the bottom of this post. An A-Frame or Lyre Easel is designed for the artist with a limited amount of workspace. With its two legs in the front and one leg in the back, this triangular easel can fit easily in the corner of a room. It can also be folded flat and stored away. This style of easel is not recommended for use with larger canvases. It lacks the sturdiness of some of the other styles mentioned in this article and may collapse under the weight of an oversized canvas. Like all of the other products in this category, the Mabef Lyre Easel M-11 folds up for easy storage. It has a solid and, as noted by many artists, beautiful construction of stain-resistant oiled beech wood. The only major complaint was that the height does not adjust to accommodate smaller sized canvases. This means that the canvas is not always at the artist’s eye-level, which can be uncomfortable and inconvenient. Despite its very reasonable price and environmentally-friendly bamboo construction, review after review described the Conda Bamboo Lyre Easel as being extremely difficult to assemble. The manufacturer’s instructions are confusing and there are many small pieces. Another negative point is that it’s not easy to adjust and cannot be used while standing. If you prefer to sit while you’re working and don’t mind taking the time to put this easel together, it offers an inexpensive and good quality option. Artists are generally quite pleased with the overall quality of this easel. They commended its portability, stating that it’s very easy to fold and move around the studio. Despite being fairly lightweight, it can support a heavy canvas and doesn’t have the unstable “wiggle” that is a characteristic of inferior easels. Very little assembly is required, making it easy to start painting as soon as it’s unpacked. One artist noted that the tray can be difficult to adjust, so it’s better to put it at the appropriate height before beginning a new project. Convertible or hybrid easels are designed for the artist who works in multiple types of media, because they stand upright or fold down into a horizontal table. The table position is best for drawing or painting with watercolours, while the upright position is traditionally utilized for works in oils or acrylics. If you like to switch back and forth and don’t want to be limited by the style of your easel, a convertible or hybrid option might be the right choice for you. Though there were complaints about complicated manufacturer’s instructions, most artists agreed that this easel was not difficult to assemble and praised the company for taking such good care when packing it for shipment. The reviewers were divided with regards to the sturdiness of the lightweight Best Deluxe Lobo Easel. It can withstand light to moderate use, but can wobble if an artist uses a particularly strong technique. It is not designed to support larger canvases, but it does transition smoothly from the table to the upright position and can be used for a wide range of artistic projects. This easel is a favourite, because not only does it transform from upright to table top position (with various angles in between), but it also folds flat so that it can be stored behind a door or in another tight space. It is also quite light, making it easy to move it from one position in your studio to another. However, the design is somewhat cumbersome and it’s difficult to adjust the height. It’s also one of the more difficult models to assemble. This style of easel was created with the outdoor, plein air painter in mind. It takes the shape of a box, which is convenient for carrying all of the artist’s media and supplies. The lid of the box flips upwards to create the easel and three tripod-style legs fold out. The French Style easel is extremely portable. It’s also versatile, because the artist can choose not to unfold the three legs and instead use it on a tabletop. The portability of this easel makes it a favourite with plein air painters, but in removing some of the weight by using a lighter bamboo wood, the manufacturer made some sacrifices with regards to durability. The wood is thin and it can crack. Artists said that they had to be careful not to press too hard on the top cover of the box. However, it is a very reasonably priced option with the added bonus of having wheels that can be used to move the easel more easily from one location to another. The reviews were quite mixed for this particular easel. It is much heavier than the Conda Bamboo model, which some perceived as a positive because that means an increase in sturdiness. However, others complained that this makes it more difficult to carry. There also appears to be some disagreement about the overall quality. Many artists had difficulty with the legs sticking or hardware becoming loose. If you decide to purchase this easel, be prepared to spend some time making adjustments and repairs, but rest assured in the fact that Jullian provides reliable customer assistance. As the name would suggest, Giant easels are for large-scale works of art. They are not very portable, but they are sturdy and can support the weight and size of immense canvases. Additional features include a double mast and a winch that helps to lift and secure works that measure 8 feet (244 cm.) or more in height. The Best Abiquiu Studio Easel is the top of the line for this category of easels. It is a very high quality construction of heavy oak wood and can support the weight of a very large canvas. It includes a winch and a melamine tray that can be used as a palette. However, this level of quality comes with a higher price tag. It is also quite large, so it should only be purchased by artists with sufficient studio space. Don’t forget to consider the height of your ceilings before deciding to invest in this easel, as it can extend up to 381 cm. While most easels are designed to hold either large or small canvases, an adjustable winch and frame make it possible to use the Best Classic Santa Fe II Easel with a wider variety of canvas sizes. This model was praised for its solid oak construction. However, the plastic fittings are unreliable and some of our reviewers found that they cheapen the easel’s look. Also, one artist noted that the wood finish is quite rough and could benefit from an extra sanding. The base of an H-Frame easel is rectangular, consisting of four right angles. An easel in this category might have one or two masts, depending on its size. Unlike the A-Frame or Lyre style, the H-Frames are not very portable and generally can’t be folded up for storage. However, they are sturdier and can support the weight of much larger compositions. This is not the ideal easel for the artist with space limitations, but if that is not a concern for you, an H-Frame easel might be worth the investment. This is a light-duty easel, designed for use with smaller canvases. It was noted that the shelf that supports the canvas cannot be adjusted all the way down to the floor to accommodate a tall canvas. The shelf also does not adjust independently. The entire mast of the easel has to move up or down, which can be inconvenient and impossible if your studio has low ceilings. However, this is one of the few products that can be used right out of the box and it has a very sturdy construction, despite being lightweight. This easel falls between light and heavy-duty, meaning that it can be used with a variety of canvas sizes. It is constructed out of a more renewable hybrid eucalyptus tree with a beautiful hardwood colour. Assembly is just a few simple steps and though it is easy to move around the studio, the sturdiness of this easel ensures its lifetime of many years. There were some issues with quality control noted by reviewers, so be sure to check for any manufacturer defects or missing pieces after purchasing this easel. This heavy-duty easel was built to support the weight of large canvases and to withstand heavy and repeated use. Depending on your level of experience with assembling easels, putting this one together can be difficult. The instructions state that it requires two people to construct and feature a lot of confusing diagrams. There were also reports of cracked wood and smashed boxes because the easel was not properly packed for shipment. Fortunately, the price is quite low and Blick offers a high standard of customer service and will quickly replace any damaged parts. This style has only one back leg and is favoured by students because it is affordable and can easily be folded up and stored away. However, it is also the least sturdy option. If you’re searching for a better quality easel, we recommend checking out the A and H-Frames. We’ve included one popular single-mast easel brand in case you are searching for a low-cost, space saving option. This easel was designed with the artist on a tight budget in mind. It takes up a very small amount of studio space while in use. It can also be folded flat for easy storage. Despite its simple construction, Utrecht offers a very sturdy single-mast easel. It can support the weight of a canvas measuring up to 50 inches. However, it is not very easy to adjust the height of the shelf. A Sketchbox easel, also known as a table easel, is just like a French Style easel, except that it does not have three tri-pod style legs. It is used for smaller compositions that can be made on top of a table and it usually features a drawer for storage of the artist’s materials and supplies. One feature that endeared many artists to this easel is its convenient carrying strap and travel bag, which weighs approximately nine pounds and is the size of a laptop. It is quite stable when constructed and can be used quite comfortably on any tabletop. Some artists mentioned that the drawer is not deep enough to accommodate tubes of paint and that supplies can rattle around in the drawer because it does not include a cover to secure them. This easel is a very simple aluminum construction that does not include a box for supplies, but is highly portable, especially with the included shoulder bag. The arms can be adjusted to accommodate a variety of canvas sizes and rubber feet ensure a secure grip on the tabletop. Many art teachers weighed in with their reviews and said that the lower price makes it possible to purchase multiple Martin Universal Design Angelina Table Easels and that they work well for students, who appreciate the light weight and ease of use. Though it is quite sturdy for its unique design, the traditional wood sketchbox easels are generally more robust. Tripod easels are often referred to as “field easels” because they are so easy to take outside. They are lighter than French Style or Sketchbox easels, but they do not offer the same storage capabilities. Easels in this category are made from either wood or metal. If you like to paint in plein air, you may want to consider purchasing one of these relatively inexpensive easels to take with you and a sturdier, pricier option for the studio. The size of the Pro Art Adjustable Aluminum Easel is, as its name would suggest, adjustable. Its telescoping legs allow it to be used as a full-size easel or reduced to the size of a tabletop easel. It is easy to set up and take down and it is also quite portable with the included carrying case. However, many artists noted that it is not necessarily suited to outdoor use because it tips over easily in the wind. The “tray” is just a thin piece of metal that is not very practical or useful for holding supplies. It also takes up quite a lot of space when the legs are fully extended. This easel is also lightweight, which means that it has the same benefits and disadvantages of the Pro Art Adjustable Aluminum Easel. The most positive aspect of its design is that it can be set up and taken down very quickly, which is great for the plein air artist who doesn’t like to waste a lot of time. It comes with a semi-hard carrying case that offers a great deal of protection for the easel, but also additional weight. One striking quality of this easel is that it’s well-reviewed by artists of varying heights – very tall individuals to artists in wheelchairs, nobody had difficulty adjusting the height of the Mabef Giant Field Easel M-32 to their eye level. It is designed to hold larger canvases, so it is heavier but also sturdier than the other options in this category. The only major complaint was about the hardware used for the locking system that holds the legs and canvas or paper support in place. Some reviewers received easels with missing or defective parts. Again, the name of this style of easel is self-explanatory. This product is perfect for the artist with a limited amount of floor space. 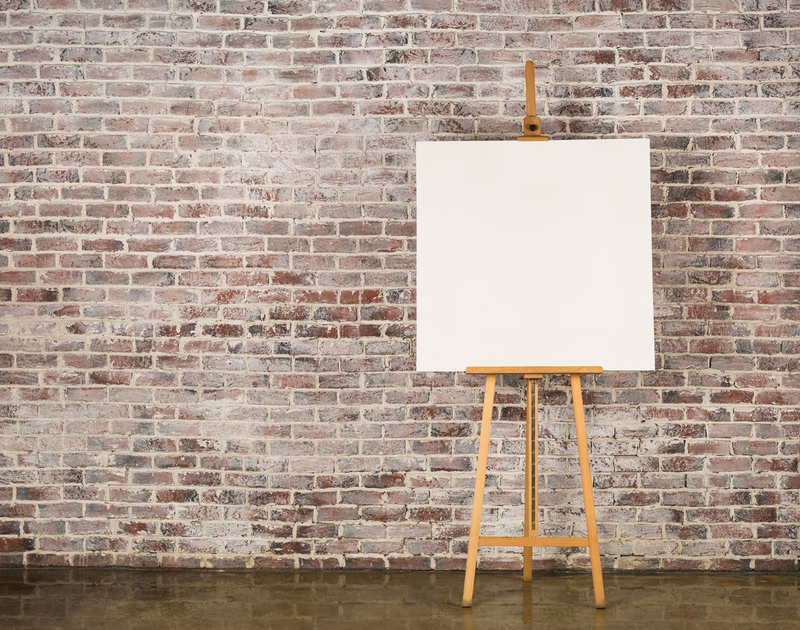 Most come in an H-Frame shape, but instead of having legs, the easel can be attached to a wall. Please remember to use the proper hardware when fixing this easel, so as not to cause an accident or unnecessary damage to your wall. The easel includes most of the essential mounting hardware, however, if you are hanging this on a plaster wall, you will need to purchase additional anchors so that the weight is supported and you do not damage your wall. Clear instructions ensure that it is not difficult to install. This model is great for artists without a lot of studio space and stability issues are eliminated because the easel fixes to the wall. One reviewer cautioned against purchasing the small top canvas holder, because it does not fit well with the system. It’s recommended instead to use the large canvas top holder, which is sold separately. Tell us more about your preferred easel style in the comments section below!